California Gov. 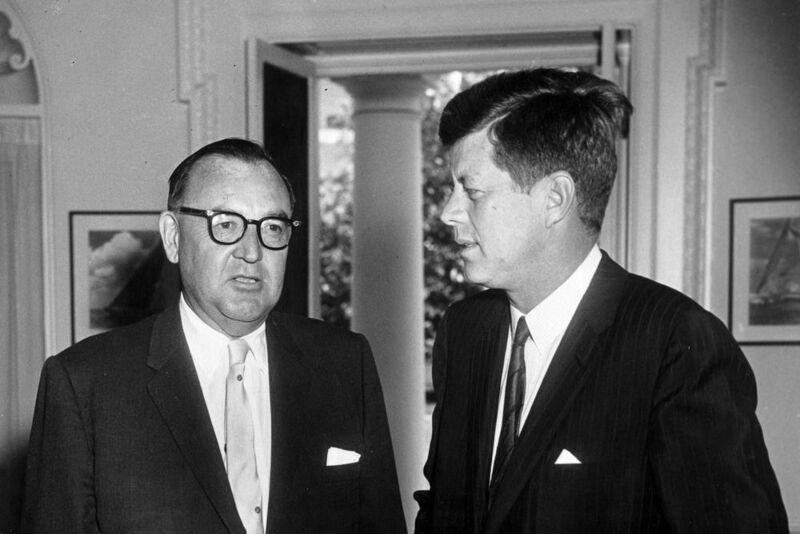 Edmund G. “Pat” Brown, patriarch of California’s powerful political dynasty, meets with President John F. Kennedy at the White House, April 4, 1961. Courtesy of Wikimedia Commons. As Jerry Brown nears the end of his record fourth term as California governor, his final months are swathed in nostalgia, superlatives, and retrospectives on a remarkable five decades in politics. But few people look back far enough: to the pivotal election 60 years ago that unintentionally spawned his father’s governorship and the Brown family dynasty. In 1958, two of California’s most powerful and popular Republicans tried to swap jobs—the governor ran for a U.S. Senate seat while the Senator tried to be elected governor. The epic failure of the “Big Switch” opened the door for an ambitious San Francisco Democrat named Edmund G. Brown, who seized the unusual moment to change the political narrative in California—and in the United States. The ramifications of Brown’s victory have resonated ever since, not only through his own political career but that of his son, Jerry, the longest-tenured governor in California history. Although California today is considered reliably Democratic, in the 1950s, it was a Republican stronghold. On paper, Democrats outnumbered Republicans in rapidly growing postwar California, but state government had been solidly Republican for decades. Between 1896 and 1958, Culbert Olson was the one Democrat elected governor, and he left office in 1943, a one-term chief executive of little note. One of the mechanisms that helped Republicans stay in power was the open primary. Candidates could run in both party primaries, and party affiliation was not even noted on the ballot until 1954. As a result, incumbent Republicans could win both lines and run unopposed in the general election. Edmund G. Brown, known to all but his mother as Pat, had been elected attorney general in 1950, the only Democrat to hold statewide office. He rejected entreaties to run for governor in 1954 against the well-liked Goodwin “Goodie” Knight, who had moved up from lieutenant governor when Earl Warren was appointed chief justice of the United States. Attorney General Brown played it safe, coasting to re-election with the second-highest vote total in state history. The top vote getter in California was also a Bay Area politician: Republican U.S. Senator William Knowland. He was scion of a prominent Oakland family that owned the Tribune, the majority leader in the U.S. Senate, prominent conservative, and presidential hopeful. In January 1957, Knowland upended the political calculus in California by announcing he would give up his Senate seat the following year to challenge fellow Republican Knight for the party’s gubernatorial nomination. Knowland’s strategy was to defeat the moderate Knight, move the party to the right, establish himself as the state’s favorite son, and thwart the presidential aspirations of another California Republican, Vice President Richard Nixon. Knowland’s daughters later confirmed in oral history interviews the widespread speculation that accompanied his surprise decision: Knowland believed he could not be elected president from the Senate. So his ambition drove him to run for governor, even against a well-liked incumbent of his own party. Democrat Pat Brown agonized for months. Should he run for reelection yet again as attorney general, a safe bet and a job he loved? Or jump into the governor’s race and hope to exploit the Knight-Knowland fight? Or run for the U.S. Senate seat now open because of Knowland’s run for governor? But Pat Brown had earlier made a secret pact with Congressman Clair Engle, a Democrat from California’s far north: If Engle ran for Senate, Brown would run for governor. Engle had announced his candidacy for Senate. After months of indecision, Brown declared in October 1957 that he would run for governor. In retrospect, the election would be viewed as the inflection point when California became a two-party state and Pat Brown became a national figure, who would leave an enormous imprint on his state. Although Knowland was a potential rival, Nixon intervened in an effort to unify the fractured party. He began backdoor overtures to force Knight to pull out of the gubernatorial race. Knight’s wife, Virginia, bitterly and vividly recalled years later the rainy night that Clint Mosher, political editor for the San Francisco Examiner, came to visit the Governor’s Mansion. Mosher was friends with both Knight and Nixon. He came to deliver a message to Knight: If he stayed in the governor’s race, Nixon would campaign against him in every county. As Knight later described his predicament: “I had no choice. I was like a man in the middle of the ocean, standing on the deck of a burning ship.” In November, he announced he would run for Knowland’s Senate seat. Democrats had a field day with the Big Switch: Knowland was a gubernatorial candidate who knew more about Taiwan than Sacramento, and Knight was a Senate candidate forced into a race he never wanted to make. Though Democrats were initially dismayed when Knight pulled out and Republicans avoided a bitter primary fight, the Big Switch turned into a fiasco for Republicans. Knight was treated so shabbily that Republicans abandoned Knowland in disgust, and the beneficiary was Pat Brown. The primary results revealed the depth of the defections: Brown won 22 percent of the Republican vote, while Knowland only won 14 percent of the Democratic vote. Since Democrats outnumbered Republicans to begin with, that meant Knowland faced an uphill climb in the general election. The bad blood between Knowland and Knight worsened, driven in part by Knowland’s support for an anti-union “right to work” ballot proposition, which would deny unions the right to require membership as a condition of employment. In the end, Knight refused to endorse Knowland. “My husband knew that if the Republican party went against labor, the working people, it would lose,” Virginia Knight recalled in her oral history for the state archives. She remembered her husband warning, “in speech after speech: ‘Don’t do this, Republicans! It’s a blueprint for disaster!’” Not only did California labor unions throw their support behind the Democratic candidate; Brown benefitted from a $1 million campaign waged by national labor organizations that viewed California as a bellwether. The internecine warfare among Republicans made Pat Brown’s nice guy image even more appealing. As they fought with each other, Brown barnstormed the state; he believed there was no one he could not win over if they met face to face. On election day, more than 79 percent of the registered voters showed up at the polls, a California record for a non-presidential election. Brown won the governorship by a million-vote margin, led a Democratic sweep, and ushered in a new political era in the Golden State. For the first time since 1889, Democrats won six out of seven statewide offices and the U.S. Senate seat, which went to Engle, control of both houses of the state legislature, and majority of the congressional delegation. The victory also gave Democrats control over reapportionment in 1961, when the state would add seven congressional seats. On the night of Nov. 4, 1958, as the results became clear, the authorities at Sacred Heart Seminary made a rare exception to the rules that barred newspapers, magazines, television, or any news of the outside world. They allowed 20-year-old junior seminarian Edmund G. Brown Jr. to watch the lone television, to see his father’s victory speech. Miriam Pawel is the author of The Browns of California: The Family Dynasty that Transformed a State and Shaped a Nation.